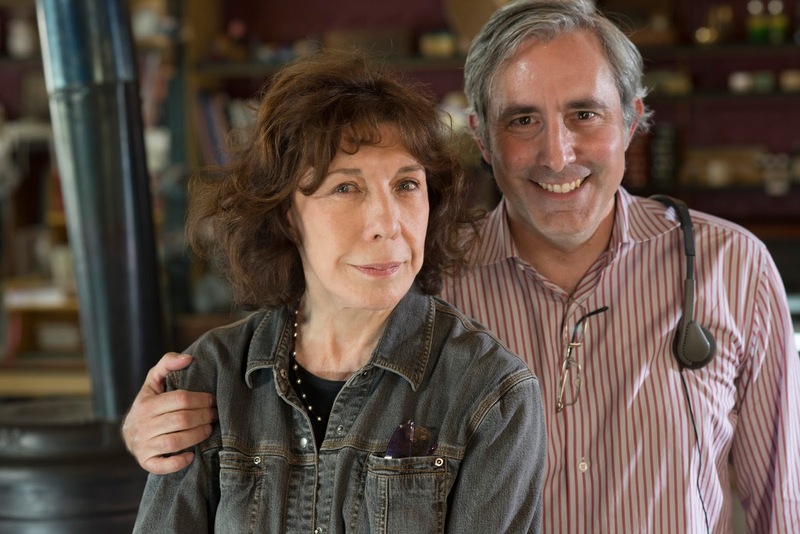 With the indie film Grandma, writer/director Paul Weitz (best-known for About a Boy and American Pie), has crafted a terrific showcase for star Lily Tomlin, one that’s likely to earn her her second Oscar nomination. She stars as an academic named Elle, who’s angry with the world since her longtime partner died. At the film’s beginning, she breaks up with her new girlfriend (Judy Greer) in a spectacularly callous manner. Then in walks her granddaughter, Sage (Julia Garner), who hopes she has the money she needs to pay for an abortion. She’s far too scared of her mother (Marcia Gay Harden), who’s also on bad terms with Elle. The two take off to round up the money for the procedure, which means Elle has to try to make amends with some of the people she’s cut off in the past. FOG! talked to Weitz about how he wrote the movie for Tomlin and how he never pictured anyone but Sam Elliott as one of her past loves. FOG! : Watching the film, I knew you’d directed it, but I was sure a woman had written it. But you wrote it as well. Paul Weitz: I did. I had just met Lily on the set of Admission (Weitz’s 2013 comedy in which Tomlin plays Tina Fey’s mother) and I was hearing her voice so well as I was writing it. I felt quite embarrassed when I realized I hadn’t made a film with a pure female protagonist. I’d done films, whether it be Toni Collette in About a Boy or Scarlett Johansson in In Good Company, with really strong female characters, but they weren’t the lead in the movie. And I thought that was kind of shameful. In this case, I think Admission just opened something for me. I’d also done films about mentorship from the male perspective, and I realized how exciting it would be to do a movie where this 18-year-old girl needs the mentorship of her 70-something grandmother who’s lived through so much history and stuck up for yourself to get people to respect her and who’s able to teach that to her granddaughter. How do you have this insight into women? I don’t know that I do. [Laughs] I think that I didn’t want to dumb down the characters in any way. My hero as a writer when I first started writing as a playwright was Chekhov. Most of his plays have female leads, and I think there’s really something wrong with you if you’re confined to developing characters of your own gender. Do you do anything different when writing female characters versus male characters? No. I think the different thing here was that I had no pressure in terms of the marketplace. I was trying to do a movie about two people who were, at the moment, broke. Elle and her granddaughter, for their own reasons, don’t have any credit cards or any money. And so it was appropriate that I was doing this movie for as little as I possibly could. That also meant I would not be getting any pressure to dumb it down. I understand that when you invest money in something that you decide whether it makes for the audience, etc. 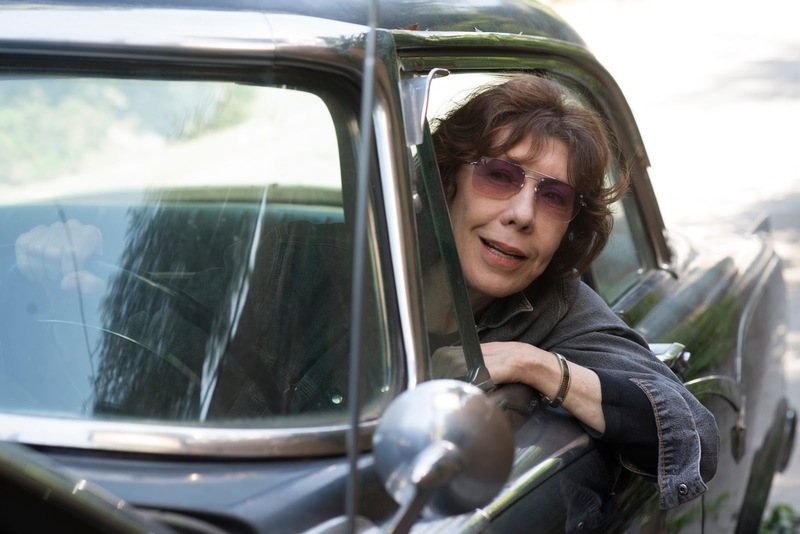 But in this case, my audience for the movie was largely Lily Tomlin. Her character is in every scene and I needed the thumbs-up and the go-ahead from her, because she knew so much more about that character than I did. Also, I know how to listen at this point. And not to get defensive. What kind of input did Lily have with the character of Elle? For instance, in the movie, she comes across this guy, Sam Elliott, after breaking up with her younger lover and you learn she’s still getting over the loss of a longtime love. And you find out that at age 21, she was married to this man and it’s quite shocking to her granddaughter. Well, I liked the idea that when she that age, similarly to her granddaughter, she was not able to give herself license to be the person that she was going to become. There’s a point where her granddaughter, so she asks, “Did you not used to like women?” and Elle says, “I always liked women. I just didn’t like myself.” I knew what I wanted that to be about. At the same, if Lily had said, “You shouldn’t do this” or “I don’t believe this,” then I would have been hard-pressed to keep it in the movie. Also, Lily had this tremendous amount of generosity of spirit. She was a great partner throughout all this. Did she ask you to make any significant changes in the script? Yeah. There’s a couple ways. I think she deepened it at every point. When I was having the character talk about the love of her life, and she’s having a hard time letting go of her grief, when I wrote that relationship, it was all idyllic. And Lily said to me, “Look, if this is real, they would have fought, they would have been mad and passionate. I think we should make this a real relationship.” So in the scene with the Laverne Cox character at the tattoo parlor, I had her talk not only about Elle’s temper, but her late partner’s temper. And, of course, Elle’s still complaining about her partner. That sort of deepening of things was taking place. And also, she would tell me the occasional anecdote or something funny that happened in her life that I was able to plunder for the movie. How did you line up the rest of the cast? I had most of their phone numbers because I’d worked with most of them in movies before. Marcia Gay Harden was the one actress I was talking about who might play her daughter, Lily was mildly intimidated by. And I knew she’d be perfect, because her daughter is the one person in the movie who intimidates Elle. Marcia and I had worked together on a movie called American Dreamz, where she played a version of Laura Bush. I worked with Nat Wolff, who plays the scumbag baby daddy who knocked up Sage, on Admission, where he played a completely different, sweet character. Sam Elliott worked with my brother, so my brother had his phone number. And then I think for numerous reasons, not least people really wanted to do this particular movie, other people just jumped in. So it was really exciting. I also should mention Elizabeth Peña (who plays a café-owning friend of Elle’s). I was so shocked when she passed away last year. Was this her last film? I don’t know if it was her last film, but it was one of the last ones that she made. But in terms of how she was on set, she was just completely eager to have a good time. Where her character is angry at Elle and jumps across the counter, it was Elizabeth’s idea to do that. So, really, it was amazing and gratifying to have all the actors we did. Sam Elliot is so great in the movie. I’m hoping he’ll get some awards recognition, which seems long overdue for him. Yeah, that would be great. You have the feeling that he’s always so good and the characters he’s playing are not always called upon to expose themselves emotionally. And in this one, he gets to start being masculine and funny, but guarded, and then go to a wholly unexpected place. Did you think of anyone else for the part of did you always have him in mind? No, I really didn’t think of anyone else. Because I thought it would be really fresh to see him and Lily together. And somehow, I felt like seeing the two of them together, you’re able to project this whole past and the idea that they’re being transported to when they were 21 years old. If she got nominated? Yeah, that would be incredible. I’ve read some articles that have talked about that possibility. It’s a thrilling idea, not least for me, because I did love Nashville so much. I’ve seen that movie about 10 or 15 times. That was her first role and she got nominated for that. She’s really a startling actress. I mean, aside from being funny. She approaches things like a dramatic actress. When I worked with her on Admission, her character had to do a couple of things in the movie while engaging in witty banter with Tina Fey. She had to fix a bicycle and she had to make sausage from scratch. It really struck me that every time she did the scene, she was actually fixing the bicycle and stripping the chains off and putting them back on. And also making sausage out of raw meat, which I’m sure was disgusting her. But she’s kind of a method actress actually. There have been a lot of great road movies this year. Why is that such a great storytelling device? Well, to me it was very helpful just taking place over the course of one day. I think that sometimes in the past I’ve tried to tell too many stories at the same time in a movie. And, in this case, it was very liberating to have a very simple story so that everything else could be as layered as I could make it. It was just a helpful too. And there’s a ticking clock there. I think we’re all so programmed by mainstream movies to expect certain plot developments: There were a few moments in the film where I thought, “Oh, now she’s going to get back together with her girlfriend.” Or “Now Sage sees a cute kid, so she isn’t going to have the abortion after all.” And it’s so refreshing that your film doesn’t go in the way that a more conventional movie would. I’m really happy you say that because I was conscious that would be very points at which you’d think – because we’re so trained, like ants, to follow the path towards resolution. I was interested in that and I wanted the movie to be really satisfying and to work as a comedy and as a drama, where as it happens, the characters do learn things from each other. But at the same time, not to sell it out at any moment. So I’m glad to hear you say that. Because this film is about someone trying to get an abortion, have you been targeted by anti-abortionists at all? There’s been some stuff on the Internet. I had one person flip out on me. I don’t know whether that would be the case of not. And, once again, I was very keen to, while this is a comedy and I think the most successful comedy I’ve done since About a Boy or American Pie, I was keen not to make light of anything. So early on, Elle asks Sage, “Have you thought about this? Because it’s something you’ll think about at some point every day for the rest of your life.” I don’t want to make light of anything or have any cheap. I don’t know what will happen. Sometimes I think back to Fast Times at Ridgemont High, which is such a great movie. It’s almost inconceivable now that there was a wildly successful teen movie where a character gets an abortion. I’d be very curious to go back and hear what the response was [at the time] and whether anyone was paying much attention to that aspect of it. I do think there is a tendency for people to get dehumanized by the issues and, to me, I’m interested in the irreducibility of our experience, which is not having anything to do with politics. I think, in terms of this movie having a foot in women’s history, Lily’s character’s of an age where she was around when it was illegal to get an abortion. And, clearly, that didn’t mean that people didn’t get abortions. It just meant they were extremely dangerous.